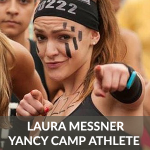 Premier OCR Athlete Laura Messner - Yancy Camp - Fitness for Everyone! Has performed very well at Spartan Stadium races as well as having great range and strong finishes at all Spartan distances. She has only begun to scratch the surface in the sport of OCR and has already had an accomplished career. You can spot Laura racing at virtually every obstacle course race series. at stadium races and 2 victories – Highlight: Strong year while working through several challenging injuries. Laura is excited to partner and train with clients from all over the world who are ready to join her #YancyCamp Training Program. *Contact Laura for great discounts from all sponsors.